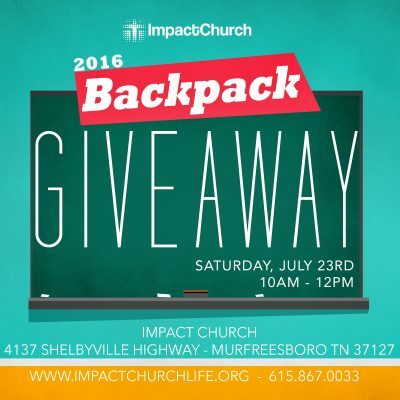 We are helping Rutherford County and Murfreesboro City Students have the supplies they need to start school by giving away hundreds of free backpacks filled with basic school supplies. These backpacks and supplies are for students entering kindergarten through 5th grade. There will be free food, games, inflatables and more! In order to receive a backpack, child must be present. First-come, first-served. Copyright © 2019 Impact Church.